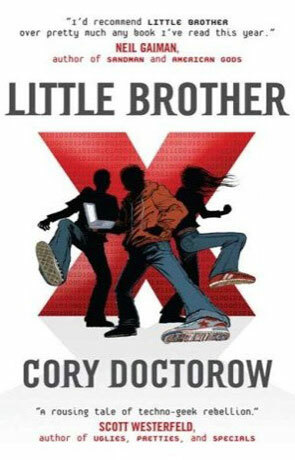 Little brother is a young adult science fiction novel written by Cory Doctorow. The novel has debuted at no 9 on the new york times bestseller list, spending 6 weeks in the top 10. The book has also won the 2009 White Pine award, is a finalist for both the Hugo Award and the 2009 Prometheus Award. Set a few years into the future, Little Brother follows a group of teenagers in San Fransisco as they live in a Big Brother society where government observation and control are an insidious part of daily life. The story follows the events of the group after a terrorist attack destroys the San Francisco Bay Bridge and the Bay Area Rapid Transit System (BART) causing widespread deaths, injuries and chaos. This incident allows the restrictive "Patriot Act II" to be put in place, while the Department of Homeland Security invades the area. After Marcus Yallow and his friends are wrongly imprisoned and interrogated by Homeland Security following the attack, after being found to be acting "suspiciously"
When they are eventually released Marcus fights back against what has become a tightly controlled police state. The novel manages to blur the line between the present and future, in both a political sense and a technological one with many current technologies still in place, while others are clearly only one step away from reality (the fourth Xbox plays a large part, with a version of Linux called Paranoid Linux running on it). While some science fiction stories content themselves with describing future technologies and how they are used, some like Little Brother explore a future that we wish to avoid, there are of course parallels to be made with George Orwells 1984, which is honored with both the Book title "a play on Big Brother and also the principle characters original "handle" "w1n5t0n", a reference to 1984's main character Winston Smith, with his later "handle" of "M1k3y" based on the computer in Robert Heinlein's novel "The Moon is a harsh mistress" (where a computer based revolution occurs). This grounding in the near future is further highlighted by a high attention to detail and references to recent events like 9/11 and past events such as the civil rights movements of the 1960's. The technical detail is spot on, with clear understandable descriptions which while slow down the narrative slightly, add value and a deeper sense of reality to the story. While this book is clearly aimed at young adults, this is a novel that also appeals to adults with a very intelligent story and a tautly crafted fictional framework that creates a thought provoking and ultimately rewarding work of fiction. Little Brother has that rare gift of really making you stop and think about the present world around us and how we not only take technology for granted but actively encourage it's development without considering the consequences. Written on 1st January 2010 by Ant.